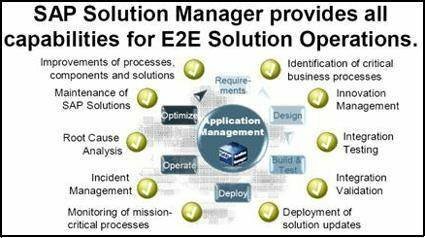 Solution Manager has become the de facto “wrapper” around SAP systems for system monitoring and support. Companies usually install Solution Manager to centrally manage their SAP landscape for handling patches, updates, service packages, monitoring back-end system hardware, maintaining licenses, handling add-ons, performing client copies, and other technical functions. SAP uses it to tie into the system landscapes for Go-Live system checks and EarlyWatch services. Today’s Solution Manager also contains a significant amount of valuable functionality that most customers rarely use -- mainly because they don’t want to make the up-front investment required to realize its benefits. Beyond its technical utility, for example, few companies make use of Solution Manager for project and application lifecycle management. It is important to note that there are two levels of Solution Manager licensing. Those with Enterprise Support contracts get everything detailed above, with the exception of the third-party add-ons (such as SAP Quality Center by HP and the RWD Productivity Pak for training and configuration documentation). The Standard Support contracts do not include business process change analysis, quality gate management or custom development management. What’s holding back greater Solution Manager adoption? Taking advantage of the project and lifecycle management tools offered in Solution Manager requires an initial project trade-off in terms of up-front costs. As a result, many customers, especially those without a clear understanding of Solution Manager’s project and application lifecycle benefits, tend to avoid the steps necessary to leverage its functionality. A general lack of understanding about how to leverage Solution Manager for implementation projects is probably the biggest reason the product is underused. If you do not have the integrated ASAP methodology and toolset installed, or had not previously planned to use some of the other SAP Solution Manager functionality, it might be time to have a discussion with your system integrator. Be sure to ask her about the Solution Manager ASAP Roadmap, scope and configuration tracking, centralized change control, integrated help ticket processing, and how Solution Manager might affect overall application lifecycle costs. Bill Wood is a business and technology consultant working in various roles on SAP projects since 1994 and operates the website at http://www.r3now.com.